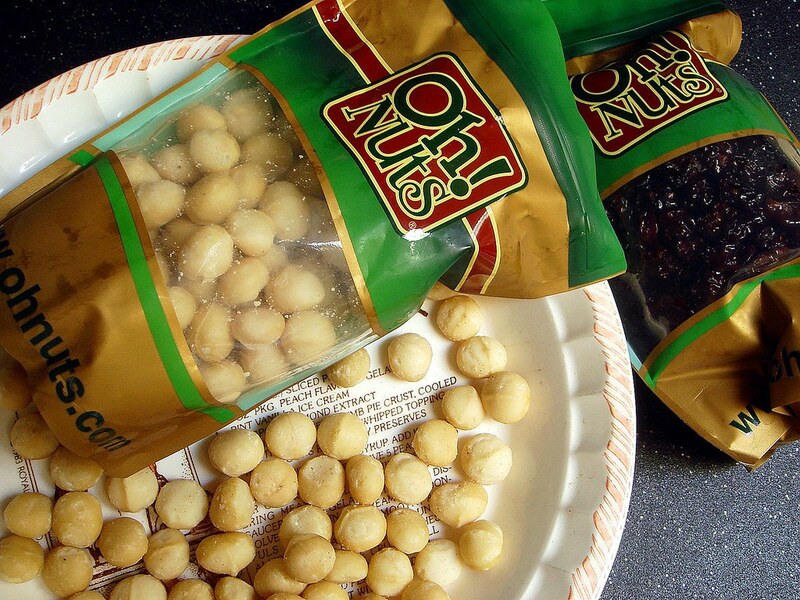 I was contacted by Sam from Oh Nuts!, who generously offered me some products to review on here. I took up the offer, and in a few days I received a bag of raw macadamia nuts and dried red sour cherries. Of course I couldn't wait to try them, so I opened the bag and tested a few of each. Macadamias have a rich, round flavor that's rather neutral whilst imparting a subtle nuttiness to recipes. The cherries were delicious and slightly tart, though I will need to plump them if I use it in baking since they weren't really plump to begin with (I'll be using these in a different recipe later). For now, I decided to use a portion of the macadamias as a coating for fish. When ground, the macadamias resemble panko bread crumbs, which is great considering that's what mixed with them, along with a few herbs, spices, and lime zest. The process went like this: Fish dipped in flour, beaten eggs, then the macadamia coating. Afterwards, the coated fillets took a rest on a baking sheet with a cooling rack on top to dry out a bit. 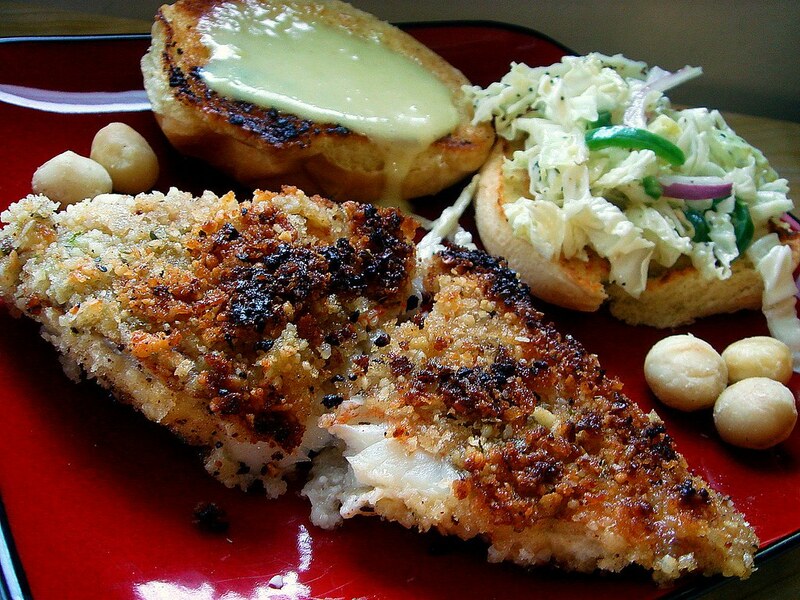 This makes it easier to pan fry the fish as the coating will remain intact. The coating crisped up nicely and the subtle heat from the cayenne pepper contrasted nicely with the flavor of the lime zest. 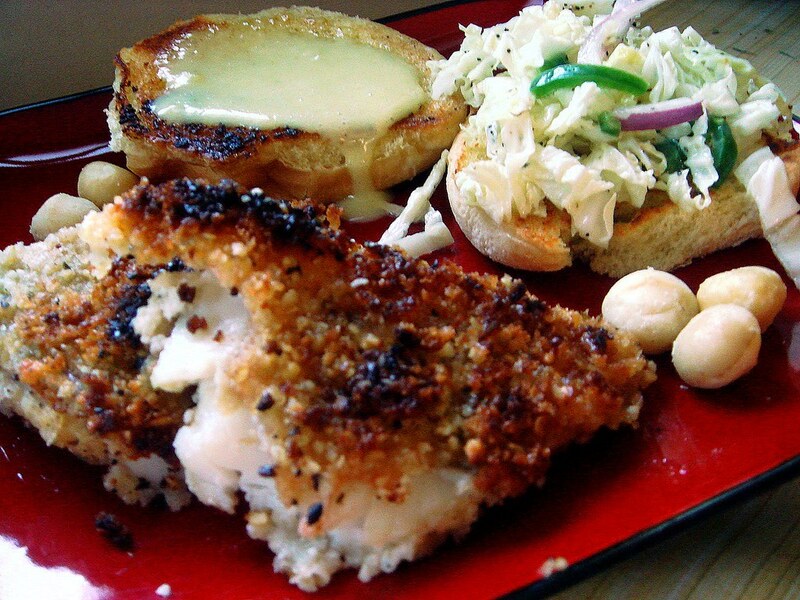 Ocean perch is a good fish to cook with since it's a bit heartier than many other white fishes with a neutral flavor that won't overpower the rest of the meal. Since I made these for sandwiches, I made a lime aioli (omitting the sweeteners, subbing lime juice for lemon, and tripling the garlic). For the greenery, I wanted a simple slaw and used up napa cabbage I had with jalapenos and red onion, which was drizzled and tossed with some of the aioli, additional olive oil, and white vinegar, plus a sprinkling of salt. Delicious on its own, but even better as a sandwich topping. Thanks again to Sam for sending me these products. Oh Nuts! has a great variety of nuts, dried fruit, and loads of other goodies to check out. Head on over to see what they have that you might need! In a wide, shallow dish (such as a pie plate) mix together ground macadamia nuts, panko, oregano, salt, cayenne pepper, and lime zest. Place the flour in a separate pie plate, and the beaten eggs in a bowl wide and deep enough to dip the fish in. Line a rimmed baking sheet with a cooling rack and place next to where you'll prep the fish. To coat the fish, coat lightly in flour. Dip in beaten eggs, then coat completely in the nut-panko mixture. Place on lined baking sheet; repeat with remaining fish. Set aside to dry for 15-20 minutes. Toss cabbage with jalapenos and red onion in a medium sized bowl. Coat with 1/4 cup aioli and a drizzle of olive oil and white vinegar, tossing to mix thoroughly. Season with salt if needed. Preheat an oven to 200 degrees. Heat a skillet over medium heat with enough oil to lightly coat the bottom. 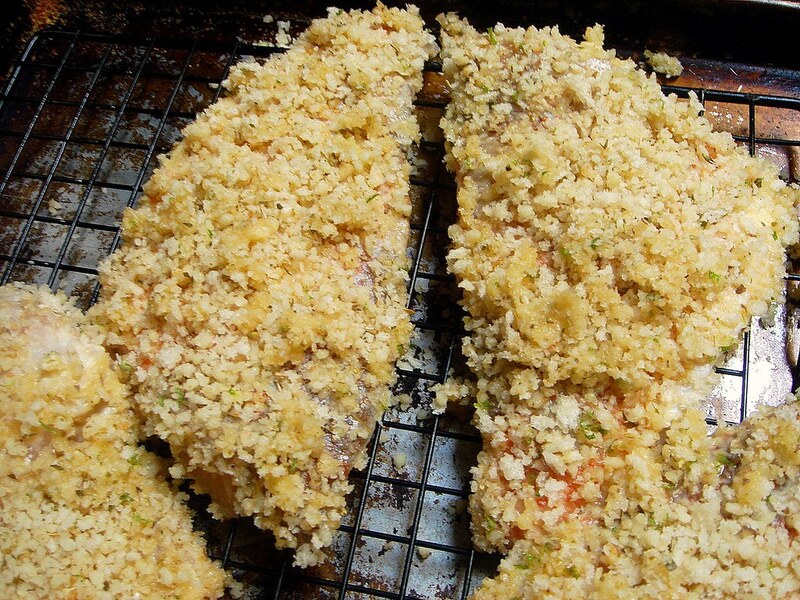 When hot, add 3 fish fillets and cook until the coating is crispy and golden brown, about 3 minutes. Flip over and continue to cook for another 3 minutes; remove to another sheet baking sheet lined with a cooling rack and place in the oven to keep warm. Repeat with remaining fish, adding more oil as needed. Serve with salad and additional aioli sauce between hamburger buns. A fish recipe...months after the end of Lent!!!!! I love macadamia nuts! I've seen Oh Nuts around but have never bought their brand of goods before. I'll have to give em a try. I love the sound of a macadamia lime combination. I bet coconut would go really well in the breading as well! What an interesting use of macadamia nuts. I've never really liked them by themselves, but this fish looks great!